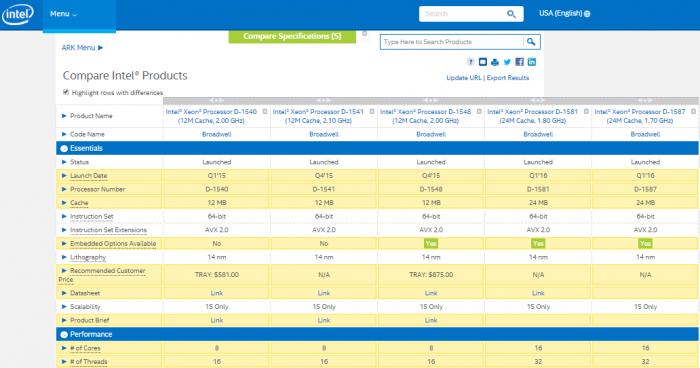 Intel Xeon D-1500 full specs for new 8/12/16 core models now available at Supermicro, good fit for home labs? but the results didn't show any of the new 12 and 16 core Xeon D-1500 CPUs quite yet. Well, that's apparently all changed today, with all the 16 core models now detailed. What do you notice? What's this Xeon D-1581? 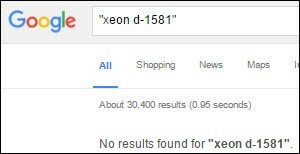 Nobody has mentioned this model before, see Google search for xeon d-1581, pictured at right. Why are both 12 core models, the Xeon D-1557 and Xeon D-1558, missing? The Xeon D-1581 is detailed below, and surprisingly, it's got a 0.1 GHz faster base clock than the Xeon-D1587 that STH just benchmarked. That appears to be the only difference. I suspect questions 2 and 3 will be cleared up before long. What's the best way to quickly see today's current 8 core models compared to all the upcoming 16 core models? Here you go! Click the image to jump over to the full ARK comparison. Why is it a suprise, and why is it of interest? Well, turns out the GHz don't drop from the Xeon D-1541, that's why. It's 4 more cores, at no decrease in speed per core. Now we're talking more VMs, without the penalty. Given the ARK listings weren't complete when I wrote this article, time to update the listing above. Done!